Cape Cod camping is all about getting outdoors and spending some time to immerse your senses into nature. Some popular outdoor activities that attract many visitors include bicycling, walking the self-guiding nature trails, fishing, shell-fishing, whale watching, bird watching, and of course, camping. Choose from several day and weekly camps for kids, and for family camping, from the numerous Cape Cod campgrounds. There's something for everyone. While camping in the summer may require reservations in advance, immediately before and after the months of June, July and August is where you will find more choice (vacancies). 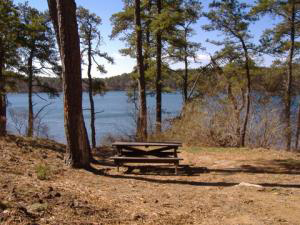 There are a few State parks offering Cape Cod camping (Roland Nickerson, Scusset Beach, and Shawme-Crowell). They are included in the lists below however, Nickerson State Park has its own page here. I felt it warranted its own expanded page because it is a such a huge area, with many, many great activities to enjoy. Here are some of the campgrounds (by section) on Cape Cod. This Cape Cod campground includes 50 amp pull-through sites, three way hook-ups, cable, wi-fi, three pools, two playgrounds and daily entertainment. Close to beaches and area attractions. Specializing in family camping on Cape Cod since 1958, Sweetwater Forest has 250 wooded campsites with fire pits and modern amenities. This Cape Cod camping resort also offers cable TV, a separate tenting area, four comfort stations with hot showers, a video arcade, 18-hole mini-golf, a grocery and general store, ice, firewood, RV Parts, a propane filling station, a fishing dock, canoe rentals and much more. Same owners as Atlantic Oaks in Eastham.Really pretty Cape Cod camping amongst pine and oak forests for RV and tenting. Pets are allowed and campfires are ok until 11pm. This campground features a private ocean beach, a seasonal hot tub, basketball, bocci ball, shuffleboard, exercise equipment, a game room, and complimentary shuttles to restaurants, the ferries, and shopping facilities. No campfires, and pets are only permitted off-season. Campground for RV's. Free movies playing every summer night and playgrounds. When we used to camp on Cape Cod, we stayed here a lot. The place is really geared towards families so if you prefer a quieter, kid-free location, pick another spot. The resort is located very near the Cape Cod National Seashore.They back onto a dog walk area that is adjoining the Cape Cod Rail Trail. They allow pets and campfires are permitted only until 11PM. Sites are both spacious and scenic, with many “premium sites” to meet the needs of today’s largest RV’s. 230 Sites with 35 rental units on 55 acres. Secluded tenting area with average site size of 1,600 square feet. Premium site size of 40x60', handles up to a 48' RV.Sewer, 50-amp electric and cable available. Cabin and cottage rentals in case you don't want to rough it.They have three swimming pools, hot tub, 2 playgrounds and a sports field for the kids. There is a beautiful lake with a sandy beach for swimming, fishing and boating They also have paddle boat and rowboat rentals. Pets are allowed and campfires are only allowed in their specially designed and installed fireplaces. This seaside Cape Cod campsite can accommodate all types of camping equipment with 100 sites. The nearby beach is warm and the grounds are family-friendly. On-site facilities include hot showers, picnic tables, tipi rentals, a camping store, laundromat and games room. Clean rest rooms in a rustic building,	metered hot water showers, laundry building with commercial washers & dryers. Enjoy Cape Cod camping with a natural sandy beach on a really nice 350 acre lake but it is very crowded, lots of kids. 50' x 50' trailer and tent area accommodations, on-site electric and water connections. 30-amp service in most sites. Pets and campfires are not permitted. When we used to stay overnight in Provincetown, we used to camp here. They have very tiny tent sites and you better be prepared for communal type showering facilities. Heavy gay clientelle because it's in Provincetown but the campground itself seems to be intolerant of the lifestyle. Offers 85 sites for tents, pop-ups and vans, with a separate 15 trailer spaces, accommodating motor homes up to 32' in length and travel trailers up to 24' in length, with water & electric hookups. Amenities include hot showers, modern conveniences, a camp store (featuring ice, groceries and camping accessories), a laundry, and dumping station. One pet per family is permitted but no campfires. WI-Fi in the office building, private beach, laundry. Pets are allowed but not on the beach and no campfires. Scusset Beach is located on Cape Cod Bay at the east end of the Cape Cod Canal. It is a popular swimming and camping area. The 98-site camping area is very popular with trailer campers. Reservations may be made as early as six months prior to the date of arrival, and as late as one day prior to arrival. Visitors may make camping reservations for several dates at one time. However, reservations are limited to 14 cumulative days in any one park between Memorial Day and Labor Day. There is also a 2 day minimum on most reservations. The campground office is open 8am to 8pm in season and the RV dump station is open 8am to 12 noon daily.All campsites are back-in only as there is very little room for traffic. Pets are allowed but only in certain areas. Campfires permitted also. There are many opportunities for camping at this quiet year-round campground at the beginning of Cape Cod. It has over 285 sites in a wooded setting and Yurt camping is now available. More than 15 miles of roads and trails provide hiking and equestrian access to over 700 acres of pitch pine and scrub oak landscape. 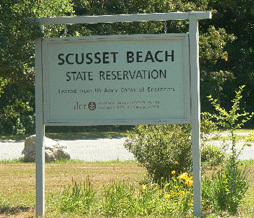 Parking access to the beach at Scusset State Reservation is provided in camping fee. Campground office hours are 8am-10pm. 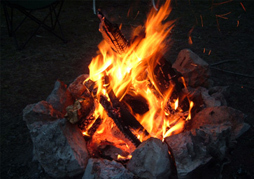 The regular camping season is from mid-April through mid-October. Off-season camping is also available. This campground has sites for tents, trailers, and motor homes, as well as cabins and teepees with electrical and water supply. They have two beaches, and are on the shore of a sandy-bottomed, spring-fed lake. Pets are welcome but no campfires are allowed. 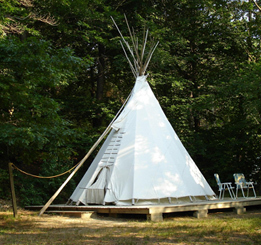 This Cape Cod camping resort offers 350 camp sites situated among pine trees. Hot water, laundry facilities and flush toilets available. Pets are allowed and so are campfires but only in special containers you must rent. For a unique Cape Cod camping experience, give some consideration to North of Highland Camping Area, near the tip of Cape Cod. Completely surrounded by Cape Cod National Seashore, with campsites nestled amongst 60 acres of pine trees, and with <>no RV hookups, this is a great place to go family tent camping. It's just a leisurely half mile walk to Head of the Meadow Beach, so campers here get to enjoy the wonders of the seashore and the enchantment of the pine forests. Enjoy clean, quiet, family camping on 237 sites, scenically located amidst Cape Cod's famous scrub pines, adjoining the Cape Cod National Seashore. Specializes in tent camping. They also have hot, metered showers, four centrally located restroom buildings, a laundromat, and a camp store. No pets and no campfires permitted. Privately-owned family campground in the midst of the Cape Cod National Seashore. The 40 acres features a variety of open and wooded sites, including many prime campsites with panoramic views of Cape Cod Bay, Highland Lighthouse and nearby Provincetown. 200 large shaded & open sites, 72 sites wth R.V. hookups.Modern restrooms with handicapped access, Metered showers, convenience store, laundromat and dump station. The peaks of the Eastham Dunes dominate the scenery of this vicinity. Cape Cod camping featuring tent, cabin and cottage sites. Shady sites in a pine grove. Amenities include flush toilets, metered showers and a canteen. No pets and no campfires allowed. Featuring a "quiet couples section" and a "family section." They also have trailer sites and there are crystal clear kettle ponds nearby for fresh water swimming. No pets allowed here but they do allows campfires.